What Do We Know About Alpha Centauri? 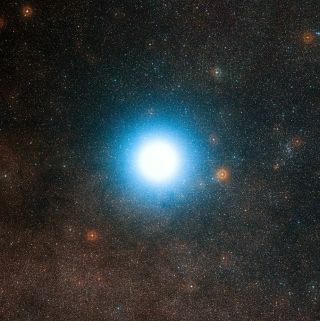 This wide-field view of the sky around the bright star Alpha Centauri was created from photographic images forming part of the Digitized Sky Survey 2. The star appears so big just because of the scattering of light by the telescope's optics as well as in the photographic emulsion. Alpha Centauri is the closest star system to the Solar System. Image released Oct. 17, 2012. Stephen Hawking, Yuri Milner and Mark Zuckerberg helm the board for a new initiative, Breakthrough Starshot, whose technology could be used to someday reach Earth's neighboring star Alpha Centauri after just a 20-year journey. Besides being an easy target — it's among the closest stars to the sun — astronomers have been eying our stellar neighbors for potential Earth-like planets. Milner said that his proposed Starshot technology could get a tiny spacecraft to the system, traveling at 20 percent the speed of light, in around 20 years. But barring that, it would be a long trip indeed. The stars of Alpha Centauri lie 4.3 light-years from us, which is around 270,000 times the distance from the Earth to the sun. To travel that distance within a generation, Milner said, a chemical rocket like the ones we use today would need fuel equivalent to the weight of all the stars in the Milky Way. A fusion rocket could reach the system in 50 years, but the technology is still far from viable. His proposed Starshot technology would make it there in just over 20. This chart shows most of the stars visible with the unaided eye on a clear night. The star Alpha Centauri is one of the brightest stars in the southern sky (marked with a red circle). It lies just 4.3 light-years from the Earth and one component in a triple star system. Image released Oct. 17. 2012. Astronomers have discovered an Earth-size planet orbiting one of the nearest stars in our galaxy. Learn more about Alpha Centauri in our full infographic. From Earth, Alpha Centauri appears as a single point of light: It's one of the brightest stars in the southern sky. Through a telescope, one can make out the system's two stars Alpha Centauri A and its smaller, dimmer companion Alpha Centauri B. Each has a mass that is about the same as the Earth's sun, and they orbit one another at about the same distance that Uranus orbits the sun. A third star, Proxima Centauri, is slightly closer to Earth — it's actually the nearest star outside the Earth's solar system. That star is much smaller and dimmer: it's just 0.12 times the mass of the sun, or 1.5 times the size of Jupiter, and it shines faintly at a cautious distance from the other two. In fact, some astronomers question whether it's part of the system at all, or just passing through. Astronomers first realized the bright star Alpha Centauri was a tightly orbiting pair in 1689, and Proxima Centauri was first spotted in 1915. In 2012, researchers used an instrument called the High Accuracy Radial velocity Planet Searcher to detect a planet around Alpha Centauri B. The instrument, which is part of the European Space Agency's La Silla Observatory in Chile, measured tiny wobbles in the star that suggested that a planet was orbiting it — likely just a bit bigger than Earth, orbiting its star every 3.24 days. Since then, researchers have tried to verify the planet's existence using transits — a slight dimming in the star as the planet passes by — but haven't found additional, conclusive evidence. And a re-examination of the original study suggested that the planet might be an artifact of the data processing, according to a report by the deep-space exploration site Centauri Dreams. Regardless, because of their nearness, the Alpha Centauri twins and Proxima Centauri offer a promising location to look for planets at a distance — especially using direct imaging — if researchers can filter out the complexities of the double star. And they also seem to be a good place to visit. The distance may be vast, but it could be relatively easy for Starshot's nanocraft or other interstellar travelers to blast through and beam back information to Earth about the system with a bit more than a four-year delay. While planets orbiting those stars would see a starscape that is quite different from Earth's, the stars' similarity to the sun would make their habitable zones an intriguing place to look for Earth analogues. "Astronomers estimate that there is a reasonable chance of an Earth-like planet existing in the 'habitable zones' of Alpha Centauri's three-star system," Breakthrough Starshot representatives said in a statement. "A number of scientific instruments, ground-based and space-based, are being developed and enhanced, which will soon identify and characterize planets around nearby stars." And then it could be time to go take a look.